By rebranding the whisky, and bottling at a higher strength without filtration Bunnahabhain has gone from an also ran to a serious contender for many connoiseurs. The 18 year old packs a serious punch given its low peating levels, what really stands out are some glorious Sherry cask flavours and a savoury/meaty/salty character. This is great stuff. Types of Barrel used for Aging A combination of ex-Bourbon and Sherry casks with a strong influence from dry Oloroso Sherry wood. Any Additional Information of Note Non-chilfiltered and un-coloured. A lightly peated Islay malt that has a surprisingly rich and meaty flavour profile. A good dollop of..
A great 25 year old single malt that has some rich chocolate, spice and dried fruit flavours. A real.. This is a bottle of Bunnahabhain 12 year old single malt from the 1980s. 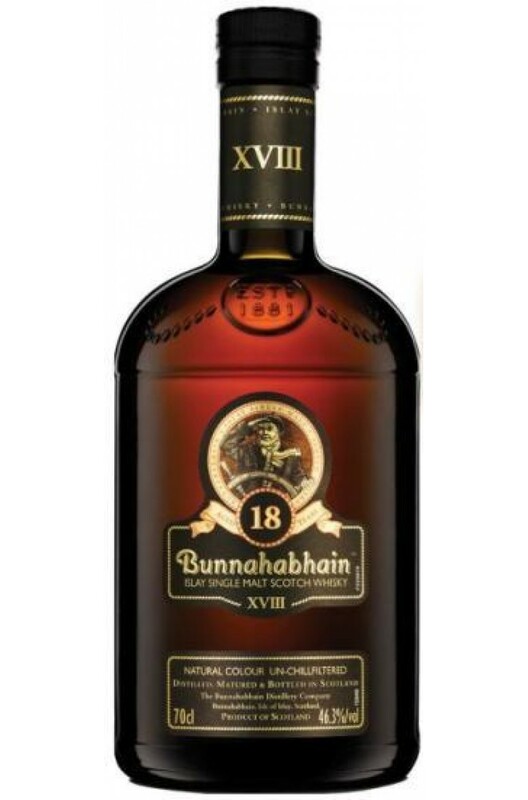 This style of bottle has..
Ceòbanach is a copper gold liquid with an unusually rich, complex character marrying ex bourb..
Eirigh na Greine means 'Morning sky' and is chosen to because this has been partly matured i..
Stiùireadair means Helmsman in Scots Gaelic and relates back to Bunnahabhain's heritage. ..